Certified Organic ,Cold press extracted Extra virgin Coconut Oil has amazing antibacterial & skin nourishing properties. Medium chain fatty acid(MCFA) constitutes 85% of the extra virgin coconut oil. This Coconut Oil is produced from fresh handpicked Organic coconuts using centrifugal extraction by cold pressing coconut milk(fresh coconut meat is grated and pressed to get coconut milk within 24 hrs of harvest).Cold pressing at low temperatures(below 38 C) allows the oil to retain its Natural vitamin E, antioxidants, nutrition, fresh coconut aroma that makes it one of the healthiest oil on the planet ideal for skin & hair care. 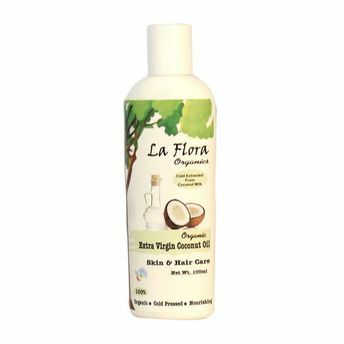 Alternatively, you can also find many more products from the La Flora Organics Extra Virgin Coconut Oil for Skin & Hair Care range.